Home/Vacuum Pumps & Controllers/It’s Time to Get a New Vacuum Pump…. How old is the oldest vacuum pump in your lab? 15 years? 25 years? 35 years? Sure it’s still working, even if it has had to be rebuilt a few times. Congratulations for keeping that old pump alive for all these years – or making do with a hand-me down. There’s another question that is worth a thought. When was the pump model you are using in your lab introduced to the world of science? You may be surprised to know that one of the most common vacuum pumps in labs today was introduced in the 1930s! A few cosmetic changes have been made since then, but those hulking belt-driven, oil-sealed rotary vane pumps that you use have been relatively unchanged in 80 years. How many of your other lab devices still rely on technology introduced in the 1930s? How could it be that so many lab vacuum pumps are struck in a time warp? Give the vacuum pumps credit; these are rugged pieces of equipment that do yeoman’s duty year after year. But another reason these pumps have been around so long is that they are treated as a utility; they provide vacuum needed for other applications, so they get about as much attention as other utilities like water and electricity. Vacuum is vacuum, right? How much innovation could there be in vacuum? It turns out that a lot has changed since that ancient pump was new. For starters, oil-sealed pumps that use a direct drive instead of a belt system have come along. These pumps are much more compact. Even since the introduction of the direct drive pumps, innovations have reduced the size of the direct drive pumps to the point where some are available that now occupy only a third of the bench space, one-quarter of the total volume and weigh only half as much as the belt drive pumps. Since space is at a premium in most labs, more compact pumps with the same vacuum capacity and pumping speed as older designs are a welcome alternative. The other big advance in the technology of lab vacuum supply has been the introduction of oil-free (dry) diaphragm pumps. Though oil-sealed rotary vane pumps provide deeper vacuum than most dry pumps, most lab applications don’t need vacuum of this depth. Freeze drying needs these deeper vacuum levels, as do Schlenk links and molecular distillation. But liquid aspiration for cell culture work, rotary evaporation, concentration, vacuum oven drying, solid phase extraction, filtration, nucleic acid purification, hypoxia chambers – all of these applications are best served with pumps delivering the more modest vacuum this is well within the range of diaphragm pumps. What happens when you use your rotary vane pump for these applications? When used for filtration, the excessive vacuum can evaporate the filtrate you are trying to collect. Your rotary evaporator can bump and foam, possibly costing your sample, and the time necessary to rinse your sample out of the evaporator and re-dissolve it or, worse, to recreate it. Samples may bump right out of sample tubes in the centrifugal concentrator, while cells that took weeks to culture may be lost when the cell pellet is sucked into the receiving flask with a “kill” solution along with the spent media. You could try to moderate the vacuum of your oil pump by introducing air into the lines. This is a longstanding practice. Unfortunately, one result is the pump noise that so many people associate with lab vacuum pumps. Vacuum pumps are at their quietest when they are producing vacuum, not when moving large quantities of air. Making matters worse, when the air moves through the pump oil, it creates a fine oil mist of contaminated oil with an unpleasant odor that can create a health hazard if inhaled, and coat lab surfaces, creating a safety hazard. Dry pumps operating in the range needed for your applications eliminate these issues. And speaking of pump noise, many dry diaphragm pumps run much quieter than the oil-sealed pump – some quieter than a face-to-face conversation- so you never again have to holler over a pump. Not only do diaphragm pumps provide vacuum in the appropriate range for most lab work, but they also can be controlled to give precisely the vacuum levels needed to optimize the operations. With effective vacuum control, a dry pump can provide gentle vacuum for aspiration, vacuum at non-evaporative levels for filtration, and vacuum that can selectively evaporate one or several solvents of a mixture in complex rotary evaporations. Hypoxia chambers with controlled vacuum can replicate oxygen concentration sin internal organs. All of these operations are beyond the capabilities of that old oil-sealed pump that you have huffing and puffing in the corner. One other point deserves mention. All of the oil changes and service needed by oil-sealed pumps is needed in part because the chemical vapors that pass through the pump also pass through the oil in the pump. When the oil is contaminated, it no longer seals or lubricates as intended. Further, it becomes corrosive in itself, so that the contaminated oil can corrode your pump even when it is turned off. In contrast, diaphragm pumps with chemical resistant flowpaths not only eliminate the oil changes, but can be designed with materials that are much more resistant to the corrosive action of the many acids, bases and solvents so often found in a chemical or biological laboratory. 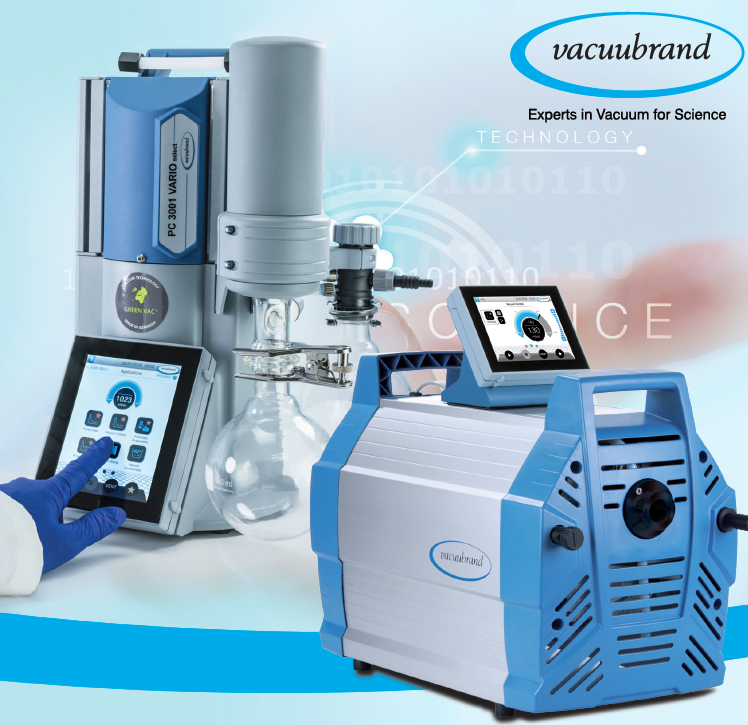 So, if you suspect that the vacuum pump in your lab is older than you are – or even if it is just as old as your kids – it is probably worth your while to take a look at some of the innovations in lab vacuum that have occurred in the decades you lab has had that old pump. You may just find it makes your work a lot easier, more pleasant and more productive. Need help finding the correct vacuum pump for your needs? Visit our Vacuum Pump Selection Guide.